Swiss luxury watch Baume & Mercier enhances its 32mm Linea family of ladies’ watches with new automatic models. Introduced in 1987, the sensual Linea line featuring 12 hour markers engraved on the bezel was an instant hit. It is one of the most versatile collections thanks to its beautifully integrated interchangeable straps. The incredibly easy-to-use interchangeable strap system, and its regularly updated strap color and leather/satin choices, makes this one of the most pleasant-to-wear-everyday watches. The new 32mm Linea automatic watches, offered in stainless steel, or in two-tone, feature various diamond settings ranging from diamond-adorned dial, to lightly diamond-set case, or a fully bedecked diamond case for ultimate shimmer. Responding to the latest trend for women’s automatic watches, Baume & Mercier has proposed a refined, feminine automatic version of Linea with diamond setting and mother-of-pearl dial. The sapphire crystal caseback is fixed with four screws to demonstrate the watchmaking know-how.T he transparent back enables viewing of the meticulously finished automatic caliber. 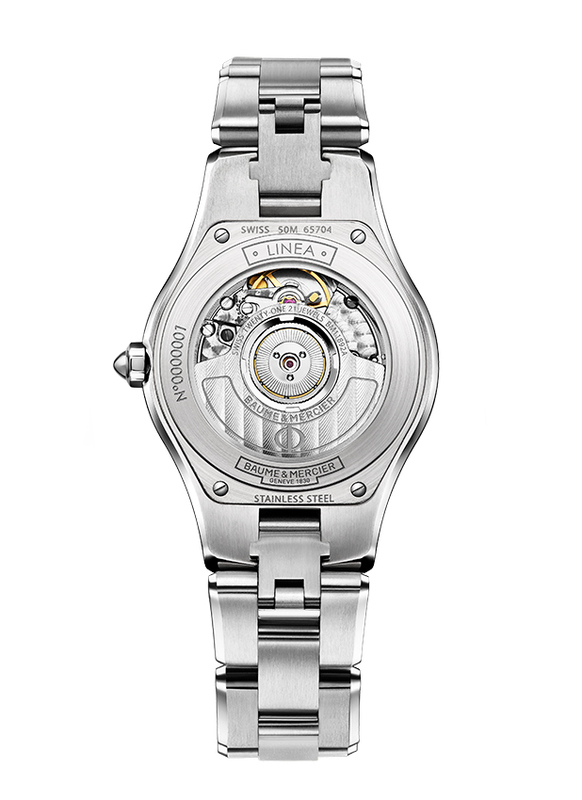 Silver-colored dial adorns two-tone version, while an iridescent mother-of-pearl dial accents the diamond steel models. Two new automatic watches complete the Linea collection. The 32mm Linea Automatic version, 10073, is created in a two-tone casewith integrated metal bracelet with luxe polished and satin finishes. The watch features a sapphire crystal case back, fitted with four screws, to enable viewing of the movement—complete with oscillating weight adorned with “Côtes de Genève” and snailed décor and featuring the brand’s signature PHI symbol. The bracelet is offered with a triplefolding security clasp. The watch is enhanced with an additional elegant brown satin strapwith pin buckle to offer versatility thanks to the ingenious Baume & Mercier interchangeable strap system. The feminine beauty is artistically anointed with a silver-colored dial with gilt handsand riveted indexes to indicate the hours, minutes and seconds. There is also a date display at 6:00. The scratch-resistant domed sapphire crystal and sapphire caseback feature antiglare treatments, while the watch is water resistant to 5 ATM (approx. 50 meters). The automatic Linea model, 10074, is an all-stainless steel beauty with diamond accents on the enticing mother-of-pearl dial. Slated to launch starting April 2012, the ergonomically curved 32mm automatic watch with Baume & Mercier’s exclusive interchangeable strap system (sold with additional strap) houses a Swiss caliber, finished in-house with a fully decorated oscillating weight. The watch offers hours, minutes and seconds, as well as a date display at 6:00. The scratch-resistant domed sapphire crystal and sapphire caseback feature antiglare treatments. 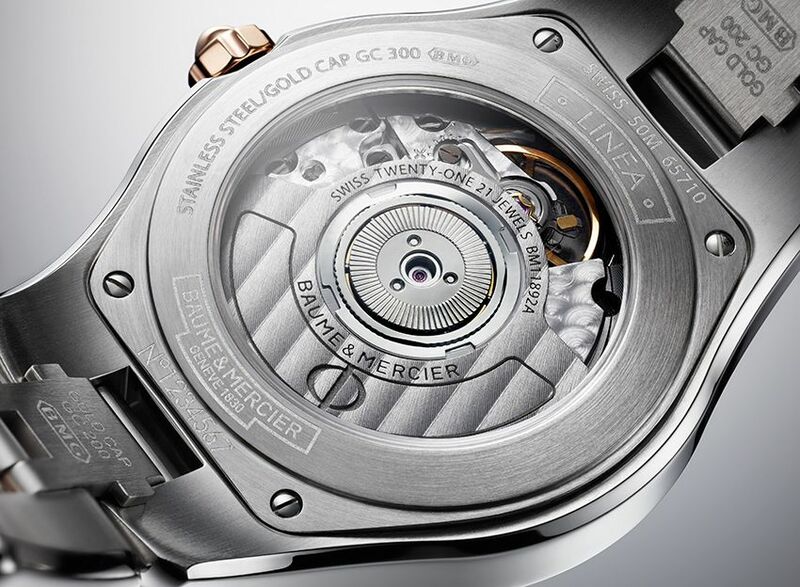 The caseback offers a view of the oscillating weight adorned with “Côtes de Genève” and snailed décor and featuring the brand’s signature PHI symbol. 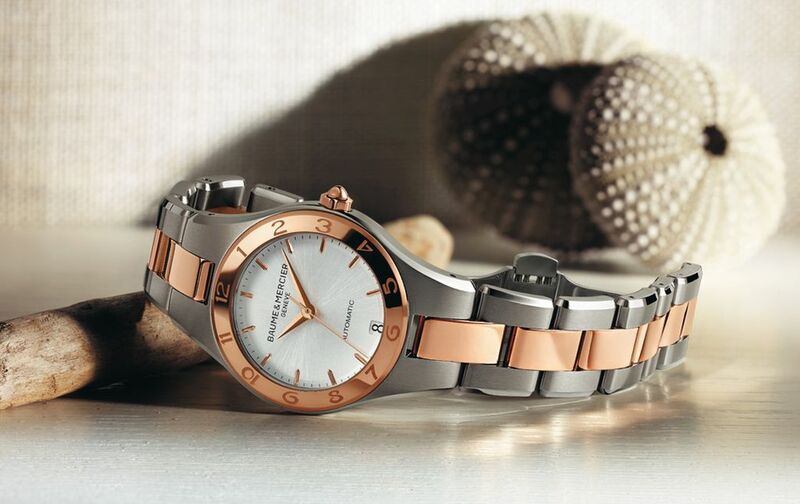 The iconic engraved bezel and beveled bracelet feature polished and satin-finished steel. The bracelet is offered with a triple folding security clasp. The newest piece is created with a mother-of-pearl dial with snailed zones that beautifully boasts 11 diamonds. It is water resistant to 5 ATM (approx. 50 meters) – offering function as well as elegant form.